Striata Spotlight Insights What is your carbon footprint? What is your carbon footprint? Today’s market judges businesses not just on the quality of their products and services and their finances but by how they do business. With governments all over the world now actively encouraging companies to reduce their carbon footprint, businesses are under pressure from all fronts to show progress in their environmental policies. A recent national survey concluded that going green was no longer just the right thing to do, but is also seen as being very positive for a company’s bottom line. One of the easiest ways to build customer confidence in how you run your business is by being proactive about your company’s impact on the environment. In recent years, the “goodwill” factor of going green has gone from “nice-to-have” to being an indicator of respectability. If you are a large corporation, the chances are good that your business already has environmental policies in place and that your annual plan includes budget towards more of the same. In addition, certain types of businesses – for example, utilities – are more likely to already have environmental policies in place, regardless of their size. There are many ways to “go green”, however, the first policies to get put in place are likely to be the ones that are easiest to implement while providing the most ROI. For industries whose business model involves regular communication with customers, one of the most cost effective and easy to implement ways to reduce carbon footprint is by aggressively turning off paper from billing, invoices, and monthly statements. Banks, utilities, telecommunications, and insurance companies are among the most prominent industries leading this trend. 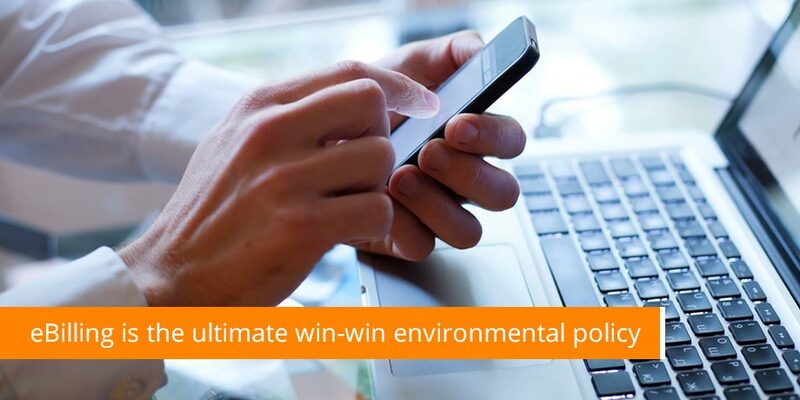 Paperless ebilling is the ultimate win-win environmental policy. eBilling falls into the category of environmental policies that are also financially advantageous for a company. Moving to the right ebilling platform lets you experience almost immediate ROI. The upfront costs are insignificant. An ebilling channel is the digital equivalent of sending bills to either an internal or external printing facility. The cost savings are per mail, so the more you send, the more you save. With 94% of Americans indicating that they are willing to make lifestyle changes to help reduce environmental impact, consumers are likely to be highly responsive to your efforts. In the US, the Electronic Payments Association and Javelin Strategy & Research have been promoting ebilling as a way for consumers to reduce carbon emissions, waste in landfills and to save trees. Their research revealed that if every American household viewed and paid its bills online, it would reduce solid waste in U.S. landfills by more than 800,000 tons a year and reduce greenhouse gas emissions by 2.1 million tons. With nearly 80% internet penetration in the U.S. alone, the market is poised to accept ebilling as the standard way to receive bills. Paperless billing is a reality that many of us are likely to see happen in our lifetime. Making that reality happen is a process that depends on both consumers and billers. Consumers have demonstrated a high comfort level with email and a rising willingness to make online payments within branded, trusted online environments. What consumers have not demonstrated is willingness to go chasing after their bills. Yet this is exactly what billers seem to expect when they build an online payment site, without a sound, proven strategy of how to get customers to come pay their bills. Not surprisingly, paper turn off rates for customers signing up to view and pay their bills at biller web sites rarely rise above 1% per year. This is by all standards a failure. Indeed, many of our clients are billers who have tried this first. However, with government, consumers, and investors now scrutinizing your carbon footprint, there’s no need to settle for such low adoption rates. We’ve found that our solution, with delivery of bills via email, matches – and for most consumers, exceeds – the convenience of paper bills. The Striata eBilling solution also allows customers to make payments directly from within the bill, providing a level of integration that can’t be matched offline. Billers who make it more convenient for customers to view and pay their bills are likely to see adoption rates of 1% paper turn off per month. We’ve seen rates like these with client after client; feel free to read some of our case studies for more details. eBilling is just one example of how environmentally correct policies can be profitable. It all comes down to picking an ebilling strategy that drives user adoption.